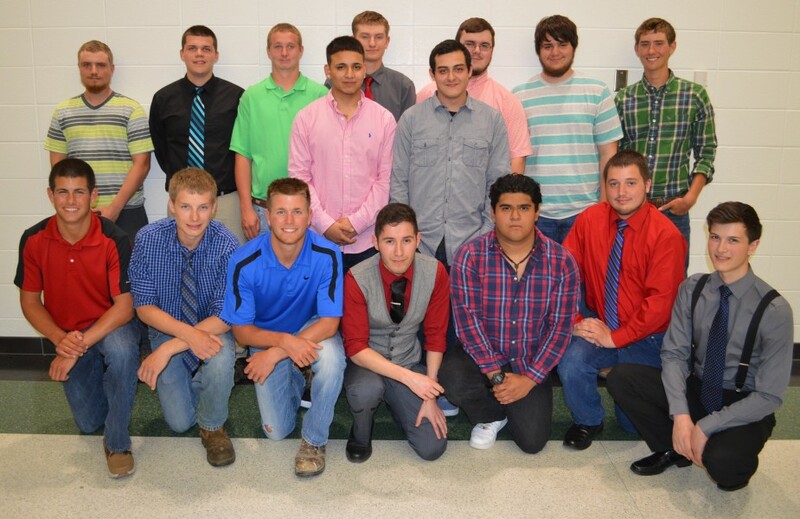 Building trades students for Wawasee High School for the 2014-15 school year include in front, from left, Nick Anderson, Chase Jacobs, Drew Anderson, Lorenzo Aguinaga, Francisco Ramirez, Andrew Zartman and Jonas Schwartz. 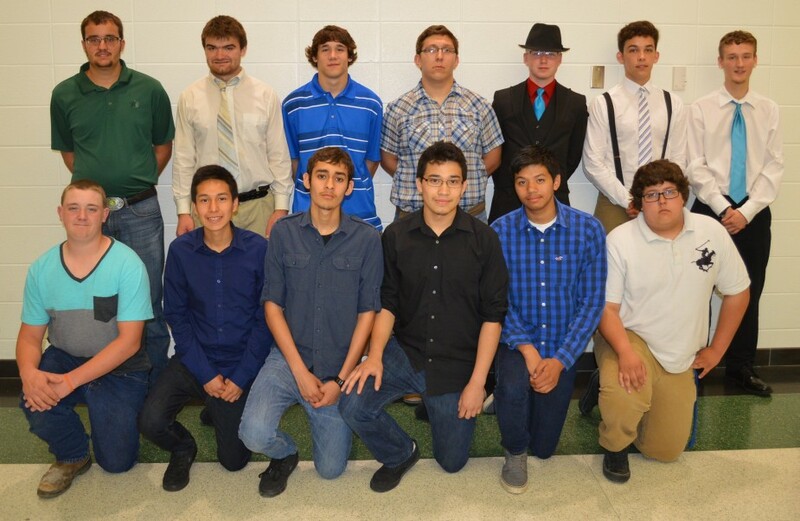 In the middle row are Daniel Pedroza and Jorge Castro. And in the back row are Michael Turner, Austin Burkholder, Kyle Smiley, Michael McCulloch, Carter Whitmer, Brady Shepherd and Bailey Hershberger. Unable to attend the banquet and not pictured are Jeffrey Moore, Aaron Walker and Maclain Herr. This year’s building trades banquet at Wawasee High School, held Thursday evening in the cafeteria, was a little different. Since the project house has been a joint effort between Wawasee and Fairfield building trades students, the banquet was a combined effort, too, and instructors for each program honored and recognized their respective students. Ed Waltz is the building trades instructor for WHS and Jeff McClure is the instructor for Fairfield High School. The project house is located at 68928 CR 25 near New Paris in Elkhart County and is being built for Darin and Darcy Holsopple. A large group of students has been working on the house. There are 19 from Wawasee, nine from Fairfield and five from West Noble High School, who were recognized along with the Fairfield students. Building trades is offered to juniors and seniors and can be a two year program depending on a student’s choice. Bailey Hershberger was named the outstanding senior for Wawasee and Tim Hostetler the outstanding senior for Fairfield. Curt Hursey, president of the building trades advisory committee, gave opening and closing remarks. Members of the advisory committee were recognized. All but four of the 33 building trades students were recognized. Four had other commitments and were unable to attend the banquet. Wawasee students in their first year of building trades include Drew Anderson, Nick Anderson, Austin Burkholder, Chase Jacobs, Lorenzo Aguinaga, Michael McCulloch, Jeffrey Moore, Daniel Pedroza, Francisco Ramirez, Jonas Schwartz, Brady Shepherd, Aaron Walker and Carter Whitmer. Second year students include Jorge Castro, Maclain Herr, Bailey Hershberger, Kyle Smiley, Michael Turner and Andrew Zartman. Fairfield first year students include Slade Espada, Jordan Keaffaber, Michael Lawson, Nicholas Ortiz, Dakota McBride and Dakota Wroblewski. Second year students include Daniel Hartzler, Tim Hostetler and Collin Miller. West Noble students include Jonlsen DeLuna, Pedro Guerrero, Wesley Hicks, Erick Reyes and Luis Zamarripa. The meal was catered by Dan Bauer with assistance from some of his WHS culinary arts students. Door prizes were given to some of the building trades students and included gas cards, a tool box, tool bag, level set and more. An open house for the building trades project home will be from 3 p.m. to 7 p.m. Friday, May 22, at the house, 68928 CR 25, New Paris. Building trades students for Fairfield High School for the 2014-15 school year include Slade Espada, Jordan Keaffaber, Michael Lawson, Nicholas Ortiz, Dakota Wroblewski, Daniel Hartzler, Tim Hostetler and Collin Miller. Not pictured is Dakota McBride, who was unable to attend the banquet. West Noble High School students are Jonlsen DeLuna, Pedro Guerrero, Wesley Hicks, Erick Reyes and Luis Zamarripa.